................................ I was walking a the same pedestrian lane (Mon-Friday) that I usually use to reach my rented room apartment that i share with another 2 dude at Wangsa Maju with high unusual record of occasional folk which like to airborne down minus (the parachute thingy) down to the apartment pavement (basically they use the apartment were I am residing as a platform to commit ONE WAY TICKET TO HELL) and straight to the underworld.That happen if u are a poor working salaryman at Bolehland or perhap the demon lord is just a cheapskate person(*Evil grin*) .Dang! I getting sick with the Bolehland LRT and my feet is getting sore from walking. I needed a complete overhaul of my lifestyle. NOW ! and ........................ bang . OUCH I just bang myself to somethingy big and i was fuming angry. What the HELL dare to stand between the "DEMON LORD" and OMG ! (*Not that OMG fella*). 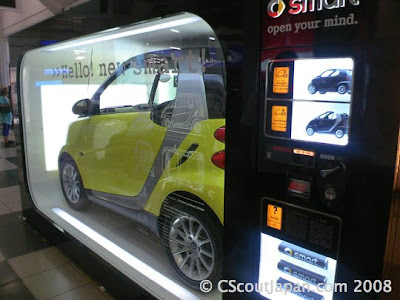 A SMART Q CAR VENDING MACHINE! 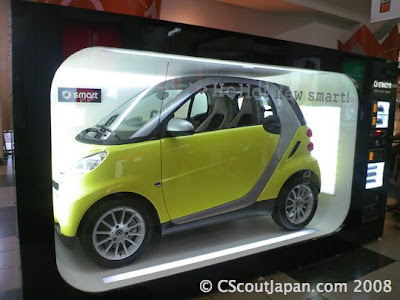 An closer inspection of the machine. Okay Just Joking! The real stuff shown above! 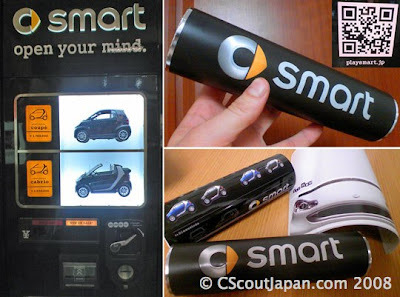 The purpose of the Smart Q vending machine is to "dispense a branded tube containing pamphlets on the new models, dealer information, and a sheet of Smart Car stickers featuring the available colors" at Shibuya Station.Feel free to visit the websites here. *I just receive an SMS from JESS .OMG! I am going to be late. THE DEMON LORD TRANSFORM and heading to Jaya Jusco Kinta City, Now!